The magician draws a large silk thru his hand, reaches underneath and produces a bowl of fire. Then suddenly, it turns to a bowl of silks or flowers. Made of heavy gauge aluminum, this firebowl has been designed with a firing mechanism that has minimized the maintenance of the firebowl. You will find the shape of the bowl conforms with ease to your body for production purposes. It is polished to a mirror finish and clear coated to keep your pan looking new for many years to come. Delightful piece of wizardry! You will receive everything you need. 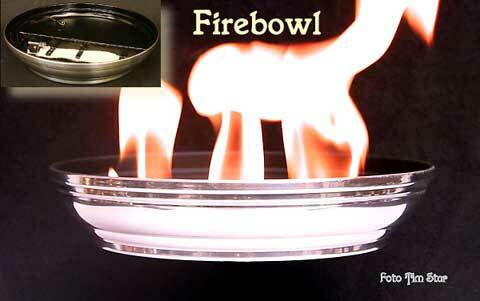 The firebowl and a special holder that will hold the bowl hidden until production, and of course the instructions.